Forgot to Pay Taxes on eBay Income? Home / eBay / Forgot to Pay Taxes on eBay Income? What should you do if you “forgot” to pay taxes on your eBay income? I asked this question of a tax friend recently and got a multi-part answer that will likely interest you. The first part of the answer was to be expected. According to the tax code you should file an amended return with form 1040X and report the additional income you omitted. I did a little bit of research on how this works when I recently ran across an electronic copy of a 1099–INT from ING Direct I thought I had forgotten to report. Luckily it turned out the interest had been reported but this is what I found in my search. It’s likely the IRS will eventually notice your error and want their money if the problem is in their favor. However, if you catch the mistake first and report it they may waive some penalties. Why will they eventually notice? Because the money was probably reported to the IRS by the company associated with the income. In this case you’ll have to work with your tax preparer or through your tax software to file the 1040X. If you used TurboTax it will help you with the form. Now for the second part of the answer. If you report income on form 1040X for previous tax periods, you are liable for interest and penalties from the date it should have been reported. The IRS may waive the penalties but they have no obligation to do so. In addition, your state will be notified of the income as well and can also collect interest and penalties. In my example above, ING Direct sent in a 1099–INT to the IRS informing them of my income. Although it will likely change in the future, eBay has not yet sent any income information to the IRS on its sellers. This means the IRS is not aware you missed reporting income. My tax friend pointed out that you can still pay the original taxes you owe and avoid the penalties by reporting the income on the next year’s tax return. Of course, the tax code requires you to report the income in the period in which you earned it and if you ever get audited you’ll owe even more interest and penalties than you would have because more time will have passed. I’m not a tax expert so ask your accountant about the potential implications of this approach. I’m not recommending you wait to report missed income, just passing along what I found in my research. Personally, I paid taxes on my eBay income from last year and paid estimated taxes for this year so I should be all set. Some people feel if you catch an honest mistake and report it you shouldn’t be penalized. They might ask what’s worse, someone paying the taxes late vs. not paying at all because they don’t want to get hit with penalties. Of course, the IRS doesn’t care if the mistake was honest or not, they just want their money and will take as much of it as the law says they can. The simplest solution is obviously to not miss anything on your tax return. The best way to do that is to keep good records and not put off doing taxes until the last minute. 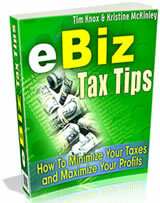 A great tax resource for eBay sellers that’s really helped me stay on top of my taxes is a book by small business expert Tim Knox and tax expert Kristine McKinley called eBiz Tax Tips. Knox and McKinley help make sense of the tax requirements for your eBay business and show you many ways to reduce your tax burden. The tag line of the book is how to minimize your taxes & maximize your income and I think the book really does deliver on that promise. If you’ve been slacking on your eBay taxes, wonder if you’ve been doing it right, or are looking for ways to reduce the amount you pay I would definitely check out eBiz Tax Tips to help get your eBay taxes under control. 11 Responses to Forgot to Pay Taxes on eBay Income? Good advice AIMM, I did setup a separate business and am figuring out all the tax stuff as I go. ParatrooperJJ, the IRS cares. Even if there is no 1099, they still expect you to report the income. If there is no 1099 who cares? if you’re selling a lot of stuff on ebay on a regular basis you should set up a separate business and report it under that entity. unless you’re making tens or hundreds of thousands of dollars,you’ll probably be able to expense out the income against regular business expenses! hence the issue of paying tax doesn’t arise since there isn’t any profit left over! I agree you must report any income to IRS. But if you happen to use form 1040X for previous tax periods. It triggers an alarm in the IRS computer system and you will certainly be auditted. I would advice anyone to be aware and extra cautious. I have learnt my lesson the hard way. Good luck! Lazy & Patrick, you’re right, most people who are just selling stuff to clean out junk in their house and sell something for less than they bought it for don’t worry about paying taxes on the money they make. Scott, I guess I wasn’t clear in my description. First off, if there is a 1099 connected with the income the IRS will know about it for sure and the sooner you file the amended return the better. The way the second approach was explained to me was if there is no 1099, you could report the income you missed as being earned the next year so the IRS doesn’t know you were late filing it. Of course, if the IRS finds out then you’ll be in a mess, which is why I wouldn’t take that approach. Basically you’re risking saving some penalties now against owing more penalties later on if you’re audited. Zot: Hmm.. What you said might be true in the real world but I would say it’s against many people’s principles. I would be interested to know how you can avoid the penalties by paying on the next years return? There is still the failure to pay penalty from the date of the return from when the income should have been reported. I wouldn’t wait until the next year to report the income, the failure to pay penalty just gets bigger. File an amended return as soon as you find out you forgot. Plus, if you pay it with the next years returns, the 1099’s will not match up to those submitted to the IRS for that year, possibly triggering an audit for that year. I agree w/ Lazy Man here. Most things I sell on eBay are used items I’ve had around for awhile and no longer use. I don’t buy things to resell for profit. The IRS would have a very difficult time determining the difference between what I paid for something and what I sold it for. So I can have sales and earn money for items I don’t need, but it isn’t profit if I sold them for less than their original purchase price (depreciation of business owned items notwithstanding). For business owners who use eBay to make a profit, not just clear items from the house should definitely keep very good records of profits for tax purposes. Do most people (who are not businesses) make income on eBay? I have revenue on a couple of items, but I think I take a loss on everything that I sell there when you look at the price I paid for the item. I think for most people you’re right, but one of the most interesting thoughts I heard recently is that if you’re trying to start a business and your choice is between going under and paying your taxes, just skip your taxes. If you make it, paying the taxes later won’t be a big deal, and if you don’t, the corporation won’t exist anymore anyway.